Headquartered in Kelvin, Johannesburg and with branch locations in Alrode, Bloemfontein, Cape Town, Durban and Port Elizabeth, Cummins provide 24 hours, 7-day availability of new and ReCon parts. Through these facilities, Cummins activities include parts sales and service, technical support, manufacturing, remanufacturing of components, warehousing and distribution, engineering and technical groups and sales and marketing operations. These operations and functions support the market leadership that Cummins enjoys in the diesel business through the southern African region and are specifically directed to increase customer service and satisfaction. Cummins South Africa is organised to serve four distinct but complementary business segments. Our Distribution Network serves all of our customers, products and engine applications - providing technical support, parts sales and engine and equipment service. Our Engine Business manufacturers and markets engines and aftermarket products for heavy and medium duty trucks, buses, RVs and light commercial vehicles and for equipment in the construction, agricultural, mining, marine, rail and government markets. Our Engine Business serves major local equipment manufacturers throughout the southern African territory. The Power Generation Business is a global provider of electric generators, power systems and related accessories, components and services. Products include diesel and gas generators used in recreational vehicles, commerical vehicles, and pleasure boats plus diesel and gas generator sets, transfer switches, and switchgear used in commercial facilities for emergency back-up and prime power. From portable power to power stations - Cummins has the solution. The Filtration and Other businesses include Cummins Filtration which provides Fleetguard and Nelson filters, silencers, emissions after-treatment and exhaust systems; and Cummins Turbo Technologies which provides Holset turbochargers to a wide range of partners, manufacturers and distributors. 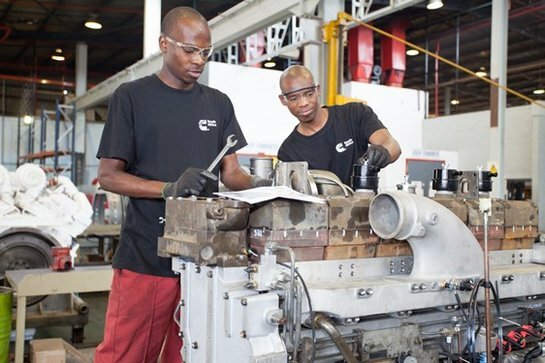 Cummins is continually developing new products and technologies and these worldwide efforts are supported in southern Africa by dedicated engineering and market support teams that ensure products are designed to meet local needs and are tested under local conditions prior to full scale release. Cummins has product development and manufacturing alliances with strategic partners globally and brings unparalleled experience and leadership in engine and related technologies to these alliances. Headquarters in Columbus, Indiana (USA), Cummins serves customers in more than 160 countries through its network of 550 Company-owned and independent distributor facilities and more than 5,000 dealer locations.